Question (AR1.Q1): How will the future of ISIS in Syria and Iraq impact the presence of ISIS in Africa? While the consideration of ISIS’s fate in Syria and Iraq of course adds significant value to the question of ISIS in Africa, ISIS’s next steps there appear to call upon a far broader set of considerations. Ultimately, the question of ISIS in Africa is complicated by the intricacies of local, state, and regional variation; competing factions and shifting loyalties, as well as the evolving situation in the Levant. Each of these issues could provide its own opportunity for a deep dive. As a first step, this report aims to provide an overview of the various considerations at play. Three broad framing questions can be used to guide an assessment of what ISIS’s presence in Africa might look like moving forward. These are: 1) whether ISIS’s ideology and approach can sustain supporters in Africa, 2) whether African states are strong enough to withstand ISIS’s influence, and 3) whether ISIS or Al Qaeda will prevail in Africa. Can ISIS’s Ideology and Approach Sustain Supporters in Africa? A key question is whether ISIS’s ideology and approach hold appeal for the varying groups and communities in multiple regions across Africa. Na’eem Jeenah, director of the Afro-Middle East Centre, indicates that the vast majority of Muslim organizations oppose ISIS and even publicly reject its ideology1 As Barfi (New America Foundation) indicates, the core tenets of ISIS’s approach, including its focus on sectarianism, which finds favor in Iraq and less so in Syria, is “non-existent on the [African] continent.” Similarly, he notes that ISIS’s rigid and unyielding interpretation of Islam may hold little appeal to, and may even turn away, the populations of potential ISIS sanctuaries. As two examples, he notes the Bedouin in the Sinai Peninsula who traditionally have adhered weakly to Islamic teachings, and Sahelian nationals who are Muslim in name only—and thus presumably would not be attracted to such an extreme version of the faith. In contrast, Siegle (National Defense University) indicates that when ISIS has had success in attracting African counterparts, its appeal has relied on its “reputational and ideological potency.” He notes, however, that the principal influence for militant Islamic ideology is not ISIS’s brand, but instead the highly conservative Wahhabi model of Islam, which continues to exert a strong influence supported by ample funding and social media and other forms of communication. In addition to its inability to fully root its ideology in Africa, specific groups such as Al Qaeda in the Islamic Maghreb (AQIM) also appear to reject ISIS’s extreme tactics (Barfi). Beyond a rejection of ISIS’s ideology and tactics, it may simply be that the focus in Africa is on more local concerns—such as local resource competition, grievances, or funding (Campbell, Council on Foreign Relations; Hansen, Harvard University / NMBU – Norway; Henneberg, Johns Hopkins University). Barring logistical support (Dele-Adedeji, University of London), ISIS has generally not provided or promised much in the way of resources to its affiliates and others (Campbell; Hansen; Siegle). As such, it cannot reasonably compete or make appeals on those grounds. In contrast to the view that ISIS’s ideology holds little appeal, multiple contributors discussed counterpoints to this potential weakness. For example, ISIS won some respect due to its early victories, along with its innovative and successful use of social media tools and propaganda—the latter of which also has the potential to influence ISIS’s path forward (Barfi, Henneberg). Grievances against the central government (e.g., in the Sinai Peninsula) also may leave people open to ISIS influence (Barfi). For disaffected youth looking to demonstrate their agency, ISIS’s ideology and action also hold a specific appeal, particularly in Tunisia (Siegle). Finally, when ISIS was on an upward trajectory in the Levant, it enjoyed a reputation in Africa characterized by operational capacity, ability to gain and control large amounts of territory, and a singular vision and purpose—which greatly heightened its appeal among those enticed by jihad (Siegle). ISIS appears to have had the most success with recruitment in Tunisia, with approximately 6,500 Tunisians having traveled to Syria and Iraq (Siegle). In other areas, despite an initial appearance of success, ISIS’s grasp is in fact tenuous. For example, though Libya has been considered a stronghold for ISIS, it does not particularly enjoy “homegrown support” there, and in fact was aggressively pushed out of Sirte by the Libyan militia and others who viewed ISIS as a hostile foreign presence (Barfi, Siegle). Though this lack of domestic support does not necessarily prevent ISIS from its destructive activities, at a minimum, it removes a source of support, and at worst for ISIS, may provide a source of active resistance. Siegle argues that ISIS’s ability to recruit and build alliances in Africa in fact will diminish as a function of losing influence and control of land in the Levant and the subsequent hits to credibility and reputation.2 Its loss of two strongholds in Libya may also contribute to a perception that it is a failing enterprise (Barfi). ISIS’s symbolic defeat in the face of its increasing loss of territory in the Levant and losses elsewhere, along with its transition to insurgency, renders it less capable of differentiating itself from other groups, and thus undermines its very basis for calling itself a Caliphate. Are African States Strong Enough to Withstand ISIS’s Influence? A second major question is whether African states are strong enough to resist ISIS’s influence, irrespective of how local populations view the organization or its ideology. In Africa, as elsewhere, vulnerability to insurgent activity will depend in part on the strength, stability, and legitimacy of the state. All else equal, the weaker the state, the more likely it is to enable ISIS to carve out safe havens for operation. As such, the specific vulnerabilities within Africa will vary greatly based on location and current status—relative stability or chaos. ISIS’s success may for example center around their focus on targeting rural communities, where little or no government presence is felt (Adeboye, University of Ibadan; Boukhars, Carnegie Endowment for International Peace). A related factor is the degree to which formal entities (e.g., the state) or informal entities (e.g., communities) push back against these ongoing or emerging threats. As several contributors (Barfi, Boukhars, Campbell) note, factors such as (local) ethnic tensions, social and economic dislocation, geography, political instability, weak public institutions, demographic challenges, poverty and unemployment, underdevelopment, and ungoverned spaces all contribute to making the African continent an appealing one to ISIS in terms of developing and strengthening affiliates—particularly in Egypt, Libya, and the Sahel (Barfi). ISIS’s cause is also furthered by a growth in the Sahel and Sahara of radical interpretations of Islam and violent extremism (Boukhars). ISIS’s strongest presence and base of operations is in Libya,4 where it has been able to exploit political conflict and the security vacuum (Henneberg), though it also faces significant opposition there, and was ultimately displaced from Sirte (as noted above). Siegle suggests that the future success of any ISIS-linked groups in Libya (e.g., a regrouping of ISIS elements combined with fighters displaced from the Levant) would be less a function of local support required for a sustained presence and more a function of the lack of capable and centralized governance. As Barfi notes, “Libya has proved to be both ISIS’ most successful venture into Africa and its worst setback.” Similarly, though extremism has taken hold in Somalia in the face of state weakness, a countervailing factor is clan dynamics, which may stifle ISIS’s pursuit of additional territory there (Henneberg). The Sahel region may be most deeply at risk, given its expanse of ungoverned space, which ISIS is likely to target (Adeboye). As Campbell notes, the Sahel also may be the poorest majority-Muslim territory in the world, with generally weak governments in the region, and an absence of national identity within the specific states. The Western Sahel may prove particularly vulnerable to ISIS, given its combination of several factors indicated just above (Barfi).5 In West Africa, we would expect politically fragile countries such as Mali, Burkina Faso, Cote d’Ivoire, and Nigeria also to be at risk (Adeboye). While the mix of vulnerability and resilience vary in these and other countries of West Africa, they share a large mixture of factors, all of which contribute to structural fragility (Boukhars). Campbell argues that the littoral states (with the exception of Tunisia and Libya) generally are in a better position to resist ISIS’s influence (similar to Egypt) than are countries further to the south. Barfi nonetheless suggests that Egypt6—while buffered by a strong sense of nationalism, relative state stability, and a strong military—may become vulnerable in the Sinai Peninsula as its attacks on ISIS’s affiliate cause civilian casualties, resulting in the population’s subsequent sense of alienation. Will ISIS or Al Qaeda Prevail in Africa? 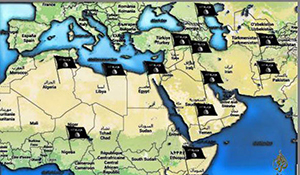 The third key theme invoked by multiple contributors is the rivalry between ISIS and Al Qaeda (and their affiliates), referred to elsewhere as a “war within a war.”7 Campbell notes that, while ISIS and Al Qaeda share the goal of a pure Islamic state administrated according to their interpretation of Islamic Law, the groups vary in the tactics they use and are hostile to one another. The relative and absolute influence of these groups also varies as a function of geography and socio-politics. Al Qaeda—which has a much longer history in Africa—may be better positioned to maintain and increase its power. 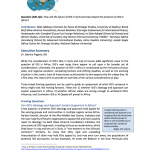 Al Qaeda affiliates such as AQIM have also been extremely agile in adapting strategy and tactics both in response to counterterrorism operations as well as to jihadi competition, and have been working to expand their footprint in Africa (Boukhars). While ISIS has, and will likely continue to have, minor footholds across Africa, their influence may be comparatively limited8 and perhaps dwindling. Several of the factors that are indicated as facilitating ISIS’s success are not unique to ISIS, but instead could be leveraged by competing groups such as Al Qaeda. These factors include leveraging social cleavages and communal distrust, migrant populations that provide a ready recruiting pool, people’s disillusionment and distrust of state institutions, ineffective counterterrorism operations, and several others (Barfi, Boukhars). ISIS has some tangible advantages, such as significant funding enabling it to draw in potential adversaries and attract new recruits, a social media arm that is superior to that of its competitors, and a large supply of human resources that can be leveraged to send operatives to global locations while preserving its base (Barfi). ISIS also may enjoy an advantage to the extent that it is seen as having succeeded where Al Qaeda failed (e.g., fighting where Al Qaeda was less willing to fight) (Hansen). Similarly, ISIS has had other symbolic victories, such as Boko Haram’s pledge of allegiance, loyalty from at least one faction of al Mourabitoun in Mali, and support from leaders such as Abdiqadir Mumin, who defected from al-Shabab—though ISIS has ultimately been unable to unseat Al Qaeda from its position of dominance.9 At the same time, Hansen notes that ISIS affiliates are geographically on the periphery of the more powerful Al Qaeda affiliates (AQIM and Al-Shabab), with the potential exception of the Abu Musab al-Barnawi group of Boko Haram. There are also tensions growing out of competing loyalties that exist within the leadership of other extremist groups. For example, the senior leadership of Al-Shabab is split between those who align with ISIS and those who align with Al Qaeda (Henneberg). However, these loyalties can be transient and oft-changing, as well as subject to convenience (Boukhars). As Siegle discusses, Al Qaeda in the Islamic Maghreb (AQIM), while affiliated formally with Al Qaeda, also has splinter groups who have pledged allegiance to ISIS. Within this context, Siegle notes, another possibility is that ISIS may gain traction over time as fighters relocate from Iraq and Syria, strengthening these splinter groups. Further complicating this rivalry, both ISIS and Al Qaeda are also fighting a variety of armies and counter-terrorist organizations as well as fighting one another—the outcome of which will have an effect on Islamic militancy in Africa in the long-run.